It’s easy to see what would attract Al Pacino, or any actor, to Manglehorn. The film’s protagonist, a small-town Texas locksmith named A.J. Manglehorn, interacts with the world through monologue. 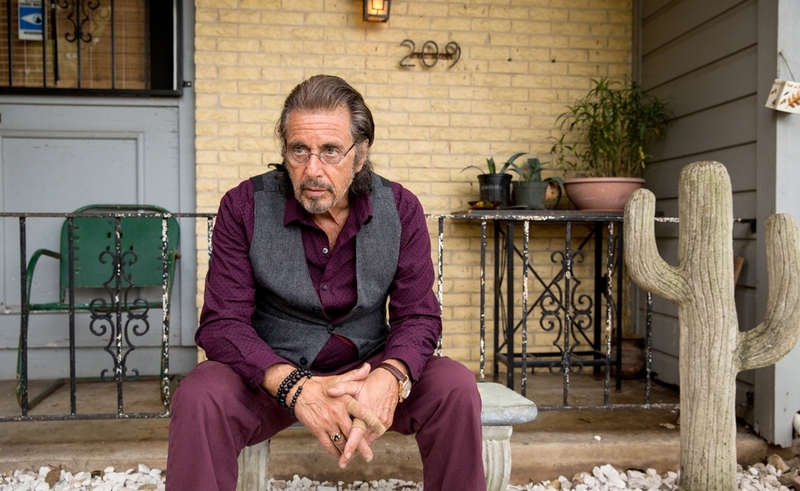 Sure, Manglehorn allows his partners some back-and-forth, but inevitably, each conversation finds him spinning off into a story or some sort of free-associative digression that Pacino treats as a four-course meal. Nobody is spared. Not his pals down at the American Legion hall. Not Dawn (Holly Hunter), the attractive bank clerk who takes a liking to him. Not his cat Fanny, whose scenes with Pacino give Manglehorn the most extensive man/cat dialogue since The Long Goodbye. And not the audience, who get to hear Manglehorn talk at length to his lost love Clara, to whom he writes regretful letters in voiceover. Then he checks a mailbox that doubles as a home to a possibly symbolic beehive for a reply. Manglehorn is an angry, lonely, talkative man. He lectures a client about keeping her car clean after he frees her child. He tells his son (Chris Messina) he never loved his mother while he complains about the food in the fancy restaurant that his son chooses for their rare dinner together. On a date to a cafeteria, he uses Dawn’s openness and invitation to go take a bath together as an opportunity to muse on the memory of visiting Italy with Clara. But he never says anything interesting, or makes the story anything but a vague, familiar tale of regret and possible redemption. Pacino never goes too big, as he’s had the tendency to do for a while, but he also never goes deep. Manglehorn wanders and rambles, and the movie follows along dutifully, even though there isn’t much to see along the way. The singular focus feels like a lost opportunity. Hunter is engaging enough that she almost sells the notion that Dawn could be attracted to the grump, and Harmony Korine is fun as Gary, a local tanning-spa owner (and pimp) who still talks about Manglehorn in hushed tones, having long ago played on the Little League team Manglehorn coached. “He’s a man of miracles,” Gary tells one of his employees. Maybe. But in spite of the impressive cast and self-conscious artistry, there’s nothing out of the ordinary here.